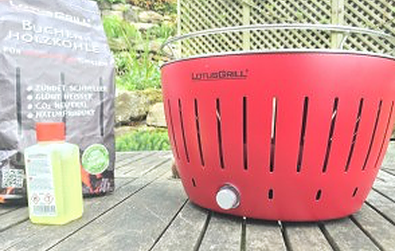 LotusGrill Review by: Campfire Magazine – Grill Time Inc.
First of all, what’s a Lotus Grill? 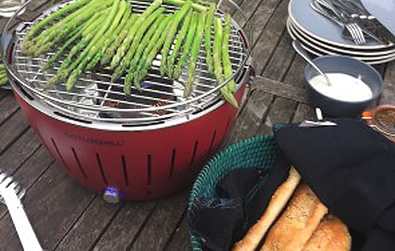 It’s a fan-assisted barbecue (battery-operated) that promises it’s ready for cooking just three minutes after lighting. It’s also claimed to be healthier because fat can’t drip onto the coals and burn. Dead easy! The charcoal goes into a neat ‘canister’ with a lid. You pour a line of ethanol lighting gel onto the trivet, light it and place it in the bottom of the stainless steel bowl. You then place the charcoal canister on top and switch on the fan at its highest. Amazing…within three minutes we had glowing coals ready for cooking. We were already won over! Because the charcoal is protected by a lid and a flat plate in the centre of the barbecue grid, there is simply no smoke when lighting. And, because fat doesn’t drop onto the hot coals, there was no smoke during cooking either. We loved it. The best barbecue we’d ever used and the best steaks we’d ever cooked – perfectly brown on the outside, pink and tender inside. You can see our menu and recipes below. It’s faster and hotter than the Cobb, which is actually better as an outdoor oven rather than a barbecue. The size was good for four and it was (relatively) easy to clean. We were also surprised at how quiet and unnoticeable the fan was. It’s more expensive than the Cobb, which includes a lid. If you do get the Lotus Grill lid, it won’t fit in the carry bag. The Lotus Grill comes in lots of colors and looks lovely.